I think Oath bound is the my least favourite book in this series so far. It just missed something and while I hoped it would be as good as the first 2 books, I actually was a bit dissapointed by this book. The story starts off interesting, get’s a bit slow, get’s interesting again and then get’s slow again and then ends action packed. It just felt a bit off, like something was missing. My favourite part of the story were the parts about Noelle, for some reason I really like her character and the whole storyline about her prophecies. I don’t know for some reason it’s really done well, I normally don’t like books about prophecies and predictions, but it really worked in this book. I wished that there was more about her in this book, because I really liked the parts about her and I would’ve liked getting to know more about her, but I realize this isn’t her story even though she saw it all and did so much to make it happen. She has a really important role in this story even though she isn’t in it. The main storyline in this book felt a bit weird, something happens really early in the book that influences the rest of the story, but it felt a bit off (yeah I am saying that a lot in this review). I thought the focus would be more on destroying the Tower syndicate, but it wasn’t, well not totally at least. I did like the characters, but they just weren’t as good as the characters in the earlier books. I liked Sera and her combination of being broken and being fierce. Kris was a nice guy and though too, but they just weren’t that interesting as the main characters in the earlier books. I did like the romance, but again it just wasn’t as good as in the earlier books. Also their relationship developed a bit weirdly. I don’t know, I just wasn’t really feeling their romance sometimes, although there where some really sweet moments too. There are a few scenes between them I really liked, especially those in which they finally talked (something that didn’t happen often). I did like seeing Kori from another perspective after having read a book from her perspective. I really like her and she has this distinct personality, a combination between fierce but still caring. We don’t get to see a lot about Liv and Cam, but they make some appearances. I also really liked Hadley and Gran, both added something special to the storyline. There isn’t a whole lot of world building added in this book, actually almost none at all, only a few tidbits of info are added. I really liked how this book expanded a bit about Noelle her prophecies and how there was even more to it. Also there is some tidbit added about a Skill, but really I didn’t see how this had added value to the story. It just didn’t add anything, except for a few sort of funny scenes. At the end, there are still a lot of things that aren’t wrapped up nicely. I am still left with a whole of questions and I would like to get a view of the future, there is still so much that is going to happen in their world. It just wasn’t a really satisfying ending for me. To conclude: I really enjoyed this book, it is really good and I love Rachel her writing style, but I was also a bit disapointed sometimes. This book just isn’t as good as the two previous books, it just misses something. There where some great parts and scenes, but there where also some slow moments. I did like the characters, but I liked the main characters of the earlier books better. The ending didn’t resolve as much as I hoped it would and the ending is still pretty open. Have you read this book? What did you think of it? Did you like the two main characters? And how good was it compared to the earlier books in your opinion? OK, I couldn’t really read your review, because I haven’t read this yet, and I don’t want to read anything at all that might spoil it for me… I’ll come back to read your review once I’ve finished reading it myself. I think that’s a good idea, while I try to avoid spoilers in my review, it does happen sometimes that a review contains spoilers of earlier books. And I spend a lot of time in this review comparing it to earlier books, so yeah I think reading the books first before reading my review is the best option in this case. It’s a great series btw, although the last book in me leats favourite. Thans for stopping by! I wouldn’t mind reading this series. It sounds like something I would like, and I do Vincent’s writing. Great review, I am glad you enjoyed it. I love Vincent her writing and I think this series is one of her best yet, although I am still a bit disapointed by the ending. I hope you will end up picking this series up eventually! Great review. I have the same odd pattern with a few series. I still haven’t read The second Mara Dyer, yet I had to have it the second it came out. Glad to hear I know I am not the only one who does that, but I still think it’s weird. I have a few more books like this, like Gameboard of the gods by Richelle Mead and I still have to catch up on the Elemental Assassin series, I have now 3 unread books in that series. And for some reason even though I am really looking forward to reading them they just keep standing on my shelf unread for a long time. Thanks for the great review Lola, I’ve read the first 2 books but even then I didn’t enjoy them too much. I think Kori was difficult to connect to in the previous book too. But thanks to your review, I think I’ll give this one a miss. I loved the first 2 books, but I was disapointed by book 3. So if you had troubles with the first 2 books already I think don’t reading the third book is a good idea. Kori was difficult to connect with at first, but I did end up liking her. It’s hard sometimes to say why your disappointed. Seems like this book lacked something more to make it complete. Terrific review and I hope the next book (if their is one) is more up your alley. 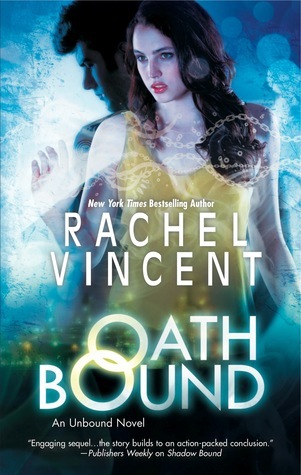 This is supposed to be the last book in this series, but I am buying everything Rachel Vincent writes so I hope her next book will be better than this one. Thanks for stopping by!